International Journal of Research in Health Sciences,2014,2,1,201-206. 1-M.D (Microbiology) Post graduate student. 2-Associate Professor of Obstetrics and Gynaecology. 3-Professor and Head of Microbiology, Chettinad Hospital and Research Institute, Kelambakkam, Chennai- 603103, Tamilnadu, INDIA. Background: Intensive care units are the epicenters of antibiotic resistance and the principal sources of outbreaks of multi-resistant bacterial infections. Early detection of multidrug resistant bacteria by phenotypic and genotypic methods can prevent spread of multi drug resistance and prevent complications. Aim: To identify the multidrug resistant bacteria from clinical samples collected from patients admitted to Intensive care units (ICU), to analyze their antibiogram pattern and to subject the Carbapenemase resistant isolates for blaKPC2 gene detection by Real time Polymerase chain reaction. Materials and Methods: 500 clinical samples from ICU were received and processed by standard methods of isolation and identification . Antibiotic susceptibility testing was done by Kirby-Bauer’s disc diffusion method. The MRSA, ESBL producing gram negative bacilli were confirmed by phenotypic tests, Carbapenemase producing isolates were initially confirmed by Modified Hodge Test and then subjected to blaKPC2 gene detection. Results: Out of 500 clinical samples studied, 200 yielded bacterial isolates and 4 yielded fungal isolates. 296 samples did not yield any growth. 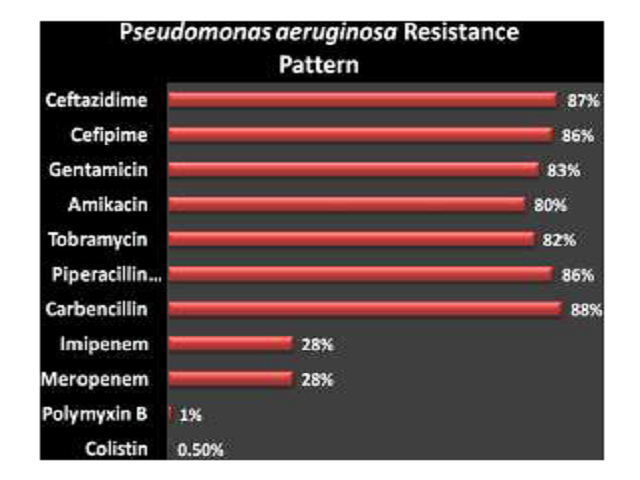 The predominant bacterial isolates were Pseudomonas aeruginosa 27%, Acinetobacter baumannii 22%, followed by Klebseilla pneumoniae 9% and the fungal isolates were 2 Candida albicans and 2 C.tropicalis. The antibiotic resistance pattern showed Pseudomonas and Acinetobacter isolated from clinical samples of ICU were 80-90% resistant to all first line drugs. Ten carbapenem resistant isolates were subjected to blaKPC2 gene detection out of which 2 were positive. Conclusion: The study reveals the predominance of gram negative bacterial isolates such as Pseudomonas and Acinetobacter in ICU samples.